I think we have a competitor for Etude House on the mouthful of a product name issue! Today I will be telling you a little about my experience with the Clio Pencil Gel Liner, which boasts to be a waterproof pencil liner, which applies just like a gel formula. Well, let me tell you something about this baby…. it’s absolutely right. 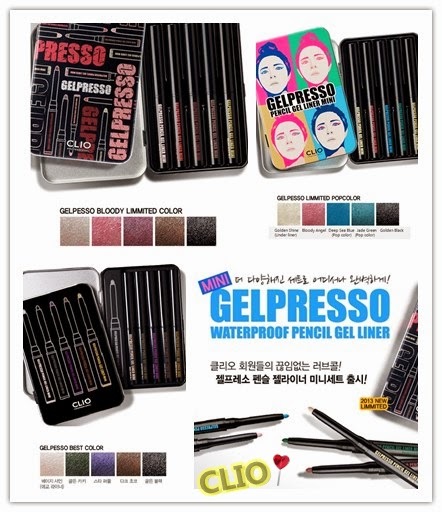 Clio’s gelpresso eyeliners are available as single pencil liners in 12 different colours, or, as an alternative you can get a full mini set of 5 colours. Personally I have one of the mini sets, and I’m frequently using the variety, but if you’re looking to try it out and make sure they’re for you, why not go with one or two to start with? My set is the Pop Colour one, containing a variety of popping and vibrant colours, including blue, green and red. It also has a golden shine colour and a black, making sure it’s great for a variety of fun looks. Now if you know me, you’ll know I’m one for colour. I love using my blues and greens lining under my eyes for an extra pop on a night out. But these liners are not only good for that. They’re easily smudged out, making sure you can blend them into one another, or blend them out to use them as a creamy eyeshadow on your lid. The formula is as mentioned above a lot like a gel eyeliner, but with the pencil it makes sure you have a good grip, and provides you with absolute control when applying. I would recommend these to any beginners as well as those more experienced with make-up and eyeliners. All in all, I’m sure to be stocking up on another colour or two very soon. The price may be a bit steep, going at £10-15 on amazon – but they are so worth it. Will you be making a purchase after reading this? Let me know in the comments below!